Research published in the latest issue of the leading international journal ‘Geology’ by Professor Andrew Cooper of the University of Ulster in conjunction with colleagues in the Universities of Aberdeen, Dundee and St Andrew’s, has discovered that the beaches and machair of the Uists and Benbecula are an unusual type of “barrier island’that are more typical of coasts like those of the eastern USA. Barrier islands survive by rolling landwards as sea levels rise and storms buffet the coast. Rather than being lost offshore, sand is conserved and pushed landwards, raising the surface of the islands as they move landwards. However Professor Cooper is concerned that sea defence measures will prevent that process from taking place and will actually destroy the islands’ fragile agricultural ecosystem. “The great days of exploration and discovery may be over, but in the Western Isles we have discovered a whole new chain of barrier islands very close to home: they’ve been there all the time, but we had not previously recognised their true nature,” he said. “There is a continuous line of sand along the western coast of the islands - known as machair, a kind of flat sandy plain that is draped over the underlying rock. The machair is the main part of the islands that can be farmed, as the rest is rocky. It’s seen as a cultural landscape, tied to the crofting lifestyle. In the Western Isles, Professor Cooper observed, the bodies of water tend to be quite shallow, and the tidal inlets are very small, but when you look at their overall shape, you can see that they are in fact barrier islands. Recognising that these are in fact barrier islands is vital for their environmental management, he argued. “Farmers that live and work on them have long thought that the islands are being eroded, with sand being stripped from them and carried out to sea,” Professor Cooper said. “Now, that we understand that they are in fact barrier islands, we know that that kind of erosion is not what is happening at all, Instead of sand being carried out to sea, it is in fact being push landwards – almost like rolling up a carpet. The sand is moving from the front of the barrier island to the back: over time, it gradually rolls in a landward direction. “Unfortunately, following big storms in 2006, a lot of sea walls have been built along the seaward edge of the islands in the mistaken belief that they will stop erosion – in fact, they are stopping the barrier islands’ natural tendency to roll landwards. “Ironically, by stopping the sand from moving, being flexible, we are destroying the coastal environment. 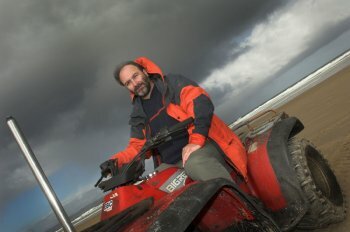 We think that by holding the sand in one place we are protecting the machair, but we’re not. “There is a lot of work that needs to be done in the area for people there to understand how barrier islands work, and to help them understand that for barrier islands, erosion is not a threat – it is the life blood of the islands. Without erosion and landward migration of the sands the islands are going to die. If you just put walls around them they will just get locked in and will eventually be submerged. With this new understanding of how the coasts of the islands work, Professor Cooper hopes new environmental management strategies can be developed that will help – rather than hinder – the survival of themachairand the traditional lifestyles that depend upon it. Caption:Professor Andrew Cooper of the University of Ulster.